This week we are bringing some of the reviews of visitors to the museum. 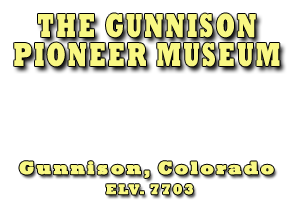 The following is what they are saying about the Gunnison Pioneer Museum. Took the kids here one day while staying in Gunnison. LOTS to see! There are many different buildings full of various historical items. The staff was very friendly and helpful. The best part is that if you can't get through the museum in one day, you can come back again another day to finish up. All on your one admission price! We stopped at the coffee shop and went on to the museum. They allowed us to enjoy our coffee and the museum all at the same time. Can't beat that! We are a family of 4, with 2 children under 10. I have to honestly say, there was not a dull moment. The entire family loved the 3 hours we spent there. Not a whole lot of museums can hold a child’s attention, for 3 hours. From the train, to the automobiles, to the war artifacts, there is not a dull moment. Highly recommend for an early morning or late afternoon activity during the summer...kinda hot in the middle of the day. We discovered Gunnison’s Pioneer Museum simply because the rain cancelled our original plans. Tourist and locals alike should visit this wonderful museum. The helpful staff will gladly answer any question you have and an open elevator was even available in the main building. My broken toe appreciated that! My mother and I loved the clothing exhibits and my dad and husband could have spent all day in the antique car museum, where 75 cars were on display. We all loved the huge display of carriages. Not sure cars and clothes are interesting enough? There are 24 buildings on the museum grounds: two rural school houses, house with early day furnishings, log cabins, carpenter, blacksmith and print shops, train and depot, dolls, toys, barn and ranch displays, to name just a few. Don’t miss the La Veta building. Besides a beautiful collection of clothes and hats, there were two ‘License for Prostitution’ displayed on the wall. There was too much to see in one afternoon so free tickets were issued so we could come back. Photos are allowed so bring extra batteries, you will need them. Something for everyone at this large Pioneer Museum. I enjoyed the old structures and being able to walk in the cabins, school houses and homes. It is not all pioneer exhibits. There are telecommunications, tractors, perfect renovated old cars and trucks, tribute to the military, train exhibit, dolls, toys, clothing (terrific). The senior greeters were so friendly and well versed. Take some water with you since it gets warm during the summer and you will spend more time there than you expected to. The first time our family was in Gunnison, we drove right past this museum. Thank goodness for second chances! We were at Blue Mesa camping this week and had some time to go into Gunnison. After picking up the brochure for the Gunnison Pioneer Museum, we decided to give it a try, and we were so thrilled we did. This is one of the best historical museums we have ever been to. There are so many historical buildings on this site, and each one is loaded with artifacts; it would be difficult to choose a favorite. Be prepared to spend some time here. We thought that we would be there for an hour tops but easily spent three hours. When you leave this place, you will be so appreciative of the history of this beautiful city. *They also have an elevator in the main house and golf carts available for people who have difficulty walking great distances. I thought this was a considerate touch. Well, if you didn’t believe our stories, we now have a lot of people worldwide that will vouch for our museum. We have at least a hundred more reviews. Remember the Gunnison Museum is looking for more exhibits and Members. If you would like to contribute to either, please contact us at the museum.